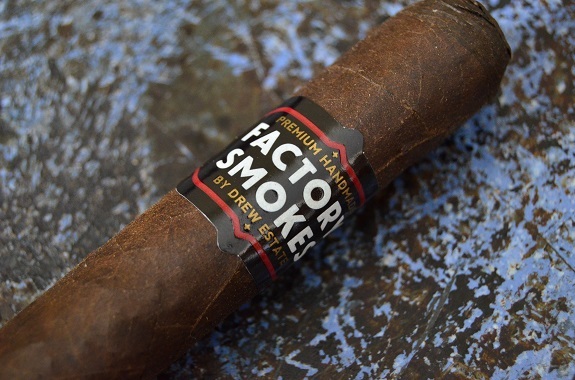 There are currently four blends available in the Factory Smokes by Drew Estate line to include Factory Smoke Sweets, Factory Smokes Maduro, Factory Smokes Shade, and Factor Smokes Sun Grown. Each blend is available in the same four vitolas: Robusto (5 by 54), Toro (6 by 52), Belicoso (6 by 54), and Churchill (7 by 50). Packaged in bundles of 25, Factory Smokes will run you less than $2 a stick. 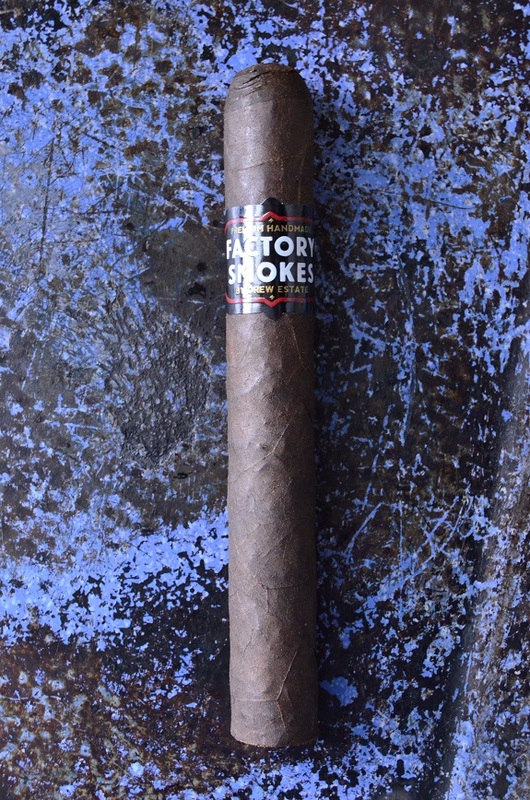 You can purchase the Factory Smoke by Drew Estate from our good friends at Famous Smoke Shop. 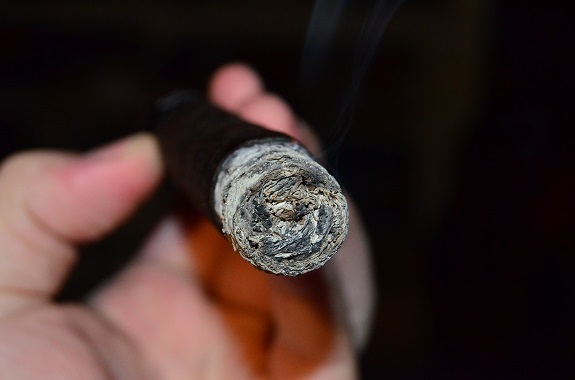 The Factory Smokes Maduro is dressed in a rough looking Maduro leaf that is full of bumps, raised veins, and a rough tooth. As I gently press down the dry-feeling cigar, I find the cigar to be somewhat spongy. As I bring the wrapper to my nose, there is an aroma is of wet earth, raisins, artificial grape, and wood. 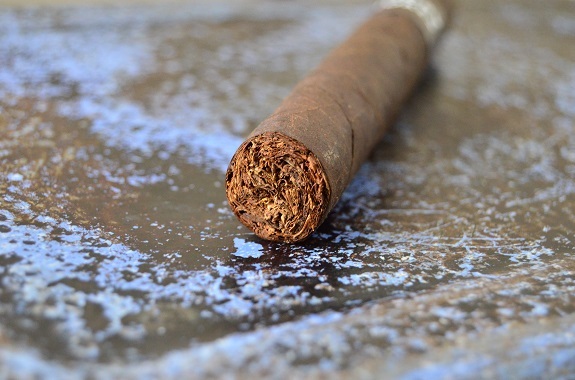 A warm cedar smell is found on the foot of the cigar. The (ugly) cap cuts with ease opening up a draw with just the right amount of resistance. Apple cider, cinnamon, and cedar come across on the cold draw with only a faint spice heat in the mouth. 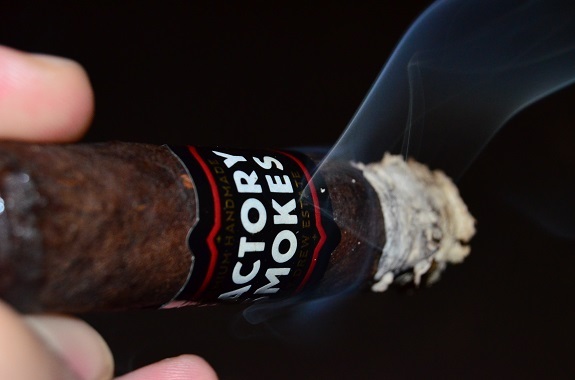 The Factory Smokes Maduro opens with an earthy and gritty profile with an underlying cocoa flavor and mild pepper spice. The cocoa sits on the finish of the smoke. 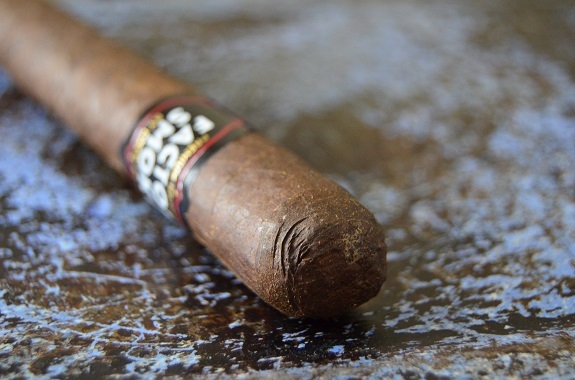 In typical Drew Estate fashion, this cigar is pumping out a copious amount of smoke as the cigar burns along evenly. A brilliant white ash forms that drops short of an inch. With the second third underway, the profile remains earthy but is now showing a good amount of pepper. The flavors are medium and meatier than before. Slowly moving the smoke through my sinuses, I find the retro-hale surprisingly smooth even though the pepper flavor is dominant. A new yeast flavor is pushing forward in the profile that is holding ground with the earth and pepper. There is now a decent amount of spice in the profile warming the palate. In line with the other two thirds, the burn is right on. 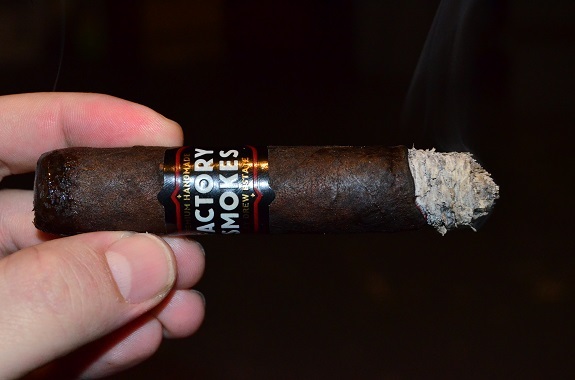 The Factory Smokes Maduro is certainly not a “glamorous” smoke with its rustic appearance and unrefined profile. But there wasn’t anything not to like about this smoke. Crazy low price, excellent burn and ash, and a profile that hits the spot. I know I will be grabbing a few bundles of these to fill up the humidor to light up while working in the yard, fishing for some Walleye, or camping with some friends.